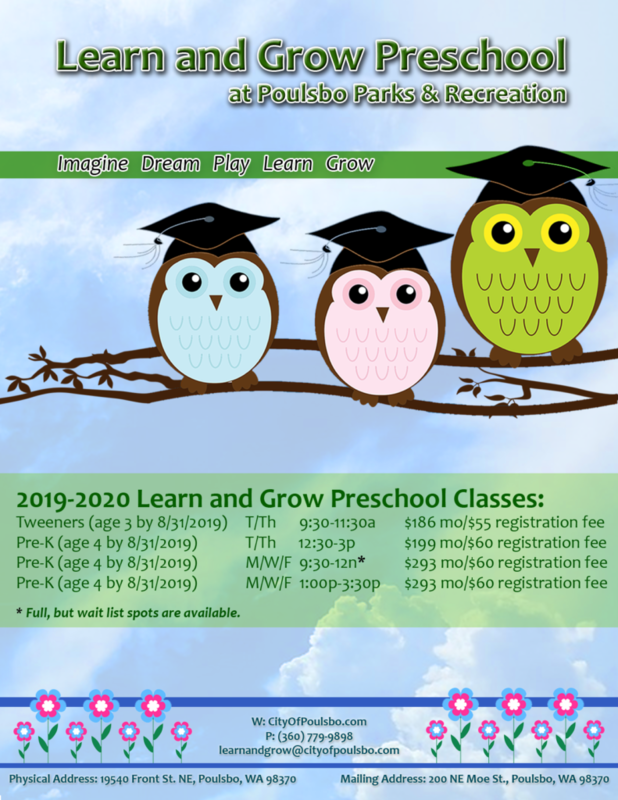 Spring is approaching, and sign ups for the 2019-2020 school year at Learn and Grow Preschool has begun! Would you like to visit the school? Or are you interested in registering? 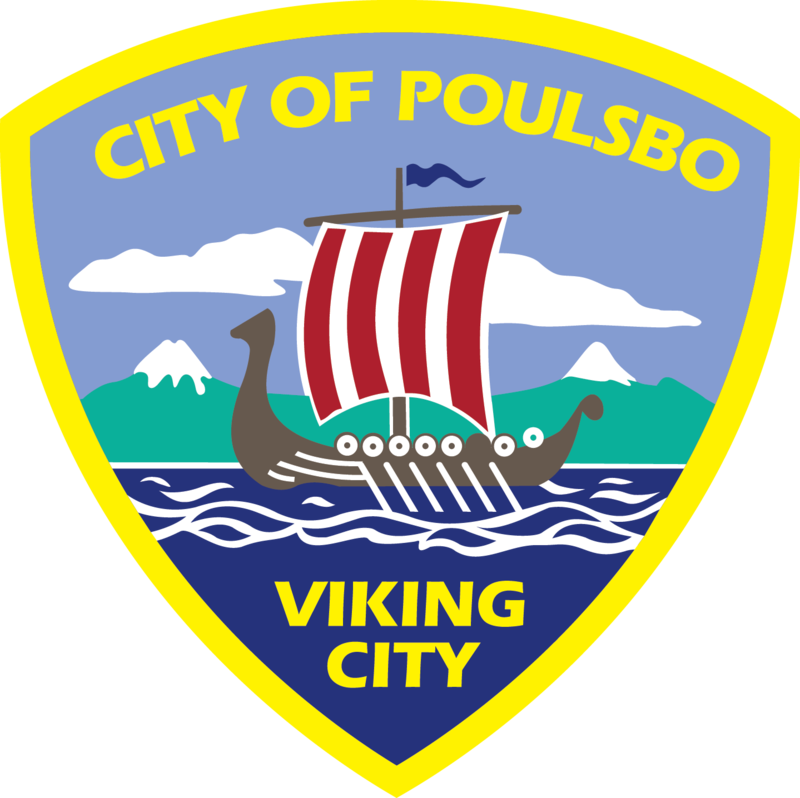 Please call Poulsbo Parks and Recreation at 360-779-9898 to check on class availability or set up a visit. We’d love to see you! Registration for the 2018-2019 school year is continuing. Families are welcome to stop by the Parks and Recreation Center at 19540 Front Street to see the preschool and ask questions of the staff. Come by to visit the school Monday-Friday, 9am-1pm Click here to see part of the Learn & Grow space. Learn and Grow Preschool currently offers two age-appropriate programs that encourage your child to explore the world around them. Classes involve a variety of fun and nurturing activities, including story time, finger plays, art, science experiments, discovery time, music and movement. Classes begin in early September and run through mid-June. The Preschool Coordinator and lead teacher is Andrea Austin. 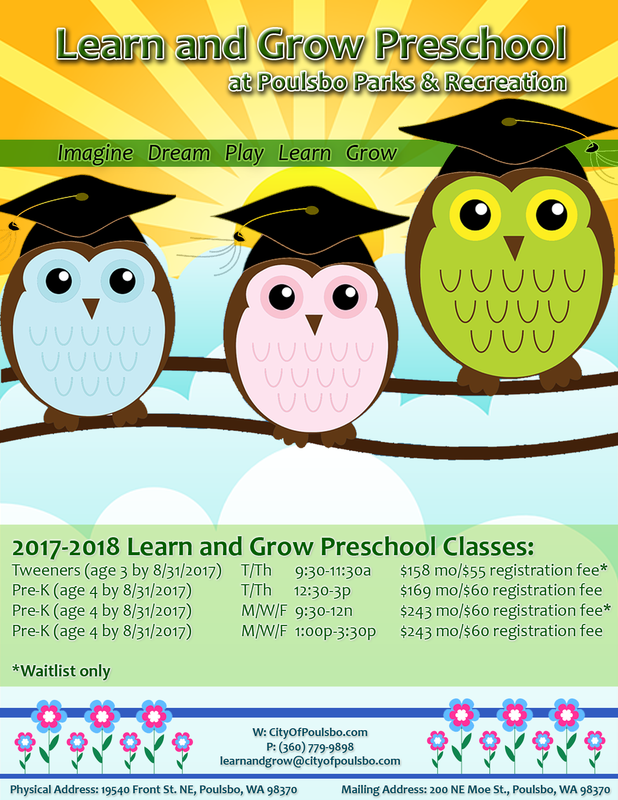 Registration for Learn and Grow Preschool is ongoing throughout the school year if there are openings. Please call Parks and Recreation at 360.779.9898 for more information..
Class sizes are limited to 14 for Tweeners and 12 for Pre-K. Classes fill quickly, but we would be glad to put your child’s name on the waitlist as openings do occur throughout the year. Tthe following is required to register for the program: A copy of the child’s birth certificate and immunization form, and payment of the non-refundable registration/supply fee. Monthly fees are based on a 9-month payment schedule running September through May of the next year. The school is fortunate to have three experienced staff members, including lead teacher and preschool coordinator Andrea Austin. Andrea returns to the Learn and Grow Preschool after teaching and running an in-home preschool for three years. Prior to that she was the assistant at Learn and Grow. Assistant Pam Raymond has a B.F.A. Degree in design/illustration. She taught art a local private school for 7 years. Preschool Assistant Heidi Allen is an experienced volunteer and assistant..
Summer preschool programs are also offered at the Parks and Recreation Center, local parks and other facilities during the warm, summer months. This is a great way for preschoolers to meet new friends and try different activities. The Learn and Grow Preschool is a part of Poulsbo Parks and Recreation, and is located in the Poulsbo Parks and Recreation Center at 19540 Front Street in Poulsbo. For additional information, please call the school at 360.779.9898.